The Chase Walk is a 38.2 mile competitive walk over and around Cannock Chase in Staffordshire, England. The walk is for teams of four to seven people, and takes place annually in March. It is organised by members of the Nationwide Scout Communications Team and friends originally from Sutton Coldfield District Scouts. The main event is open to members of the Scout and Guide movements aged 14 upwards, entries can also be accepted from some other organisations, see FAQ for details. An alternative event for Scouts aged 10½ to 14 is also held on the same day, sharing some resources with the main event. This is a 13 mile walk during daylight hours. 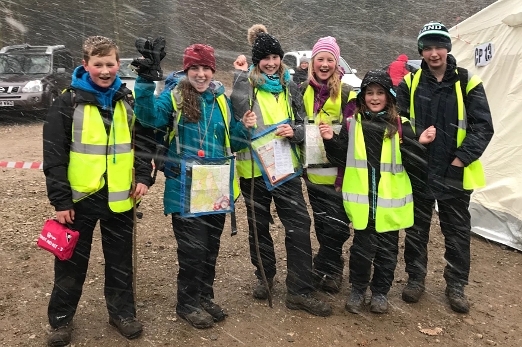 Wild weather didn't dampen enthusiasm at 2018's walk - Scout team Cheesey Chasers at the Finish. The likely date for next year is 14th March 2020 - to be confirmed in a few weeks. Results for 2019 are now available, links in the sidebar. The following companies and organisations provide invaluable support to the Chase Walk. Without their help the event could not take place as it does now.